Many breeds tend to become matted very easily. This is especially true if they get wet, and even more true if they are not brushed regularly. Mats can be very uncomfortable even when the dog walks or moves around. Oftentimes, the owner is not even aware that the hair is matted, because they are only seeing and brushing the top coat - but it is the undercoat that is full of tangles. When they finally come in for their appointment, the refrain is very familiar: "Mats? What mats? Just take a little off. I don't want him to be too short." Demat the fur. This sounds logical, and if there are just a few small mats, this option may be OK. However, dematting involves pulling a comb through the tangled hair. For most dogs who are matted, this would be too painful - it is against our policy to cause undue or excessive pain to a dog. 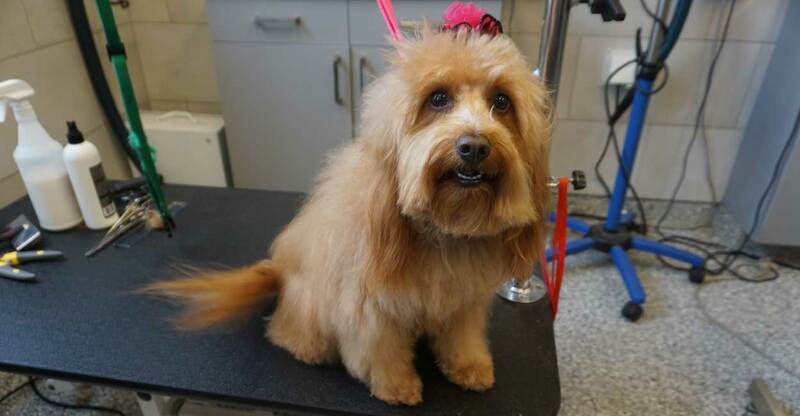 It is also very laborious and can easily double the time spent on the grooming appointment, leading to a higher fee. Even if it's possible, it can cause skin irritation and sensitivity. This can be a very stressful and uncomfortable experience for the dog, which we do not want. For these reasons, we have a 20-minute limit on dematting a dog. Go very short. If the groomer determines that dematting would be too painful or not otherwise possible, her best and most realistic option is typically to cut the matted hair very short. Sometimes this may require going to 1/4 of an inch, if the mats are too close to the skin. Now the refrain changes to "That short? But he'll look ridiculous! Plus, it's cold outside." Trust us, we take no pleasure in this option. although a dog who is shorter than normal doesn't necessarily look ridiculous in our opinion. 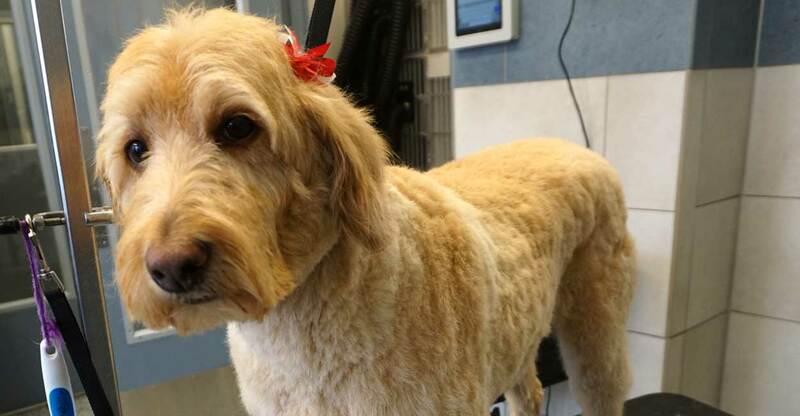 Going short can actually take more time than a normal haircut, and can be very stressful and painful for a dog. Most dogs are fine afterwards, but some dogs can seem traumatized, nervous, or itchy. This can also be because their skin just feels very different to them. Some people actually believe that the groomer is being "lazy" by going really short like this, but this is not the case - it can actually take more time and work than other options. It's not like we're alone in this assessment - take him to any good groomer, and they will probably tell you the same thing - any that doesn't would likely spend a lot of extra time dematting your dog beyond a few minutes, which again, can be excessively irritating, stressful, and painful. Minor cuts and abrasions, which are due to the electric clippers pulling at your dog's skin. The skin is lifting towards the razor due to the matted hair. Unevenness. This could occur if an area needed to be spot-shaved, or because an area of fur is not fluffing up like the rest of the hair, and may be harder to judge how even it is during the groom. Skin conditions. When the hair is matted, skin conditions can form under your dog's fur without you being aware of them. These can appear in the form of hot spots, lesions, sores, and highly sensitive skin. These outcomes are due to the fact that oxygen can't reach the skin very easily, a scratch could have formed that is not healing properly, and/or there is the buildup of bacteria that can be trapped due to the wetness and moisture. Itchiness and scratches. A dog's skin may feel itchy afterwards. This can cause them to scratch their own skin, and can create long red marks, or increased skin sensitivity. This can be made worse if their nails were just trimmed and possibly sharp. If this is the case, some customers can come to the conclusion that the groomer must have cut their dog with scissors and didn't say so. This is simply not the case, and would not be smart on our behalf because every customer would be bound to find out. If your dog's skin is itchy, their are lotions we can recommend to soothe it. Normally this itchiness stops relatively soon. Seeming a little "off". Some people report that their dog seems a little "off" afterwards, and they wonder if the groomer has somehow mistreated their dog. This would not be the case. Instead, a dog can be stressed due to the potential discomfort, skin conditions, shorter hair than it is used to, the brush or razor pulling at its skin, and other factors. We would not go excessively short without your express permission. Going very short does not necessarily mean you will see skin, and most dogs actually look really good afterwards. We typically try to keep at least a fourth of an inch, and have been able to keep it longer than this in many cases. "Spot shaving" may not work because a dog could look really patchy, and you likely wouldn't be very happy. Our groomers are professionals and will be able to tell whether spot shaving will be the recommended solution. Going really short costs extra money ($15 or higher, depending on the breed), as it requires a lot of extra time and work. If we do agree that going really short is necessary, and we proceed with your permission, the grooming is non-refundable unless there is a very good reason. It is possible that your dog may require some touchups afterwards, because as mentioned above, the hair can be challenging to work with when it is matted. If so, we are happy for you to come back for that at no charge, as long as you do so within a few days. Remember that most dogs' hair grows back pretty quickly. Now that it is short, it should be very easy to keep well-maintained, and will be much more comfortable for your dog going forward. Like all good groomers, we want to help you avoid this scenario, and to help keep your dog's coat looking its best at all times. Stick to a regular grooming schedule. For most breeds, this would be every 6-8 weeks. We will give you a personal recommendation after your grooming reservation, based on your specific dog and its coat. We will also send you a reminder when it's time for your next groom. Brush your dog's coat regularly at home, using the proper technique and brushes. For most breeds, this could be several times per week, and possibly even at least once per day. You cannot just brush the outer surface of the fur, and you must get every inch, including behind the ears, in the armpits, and on the tail. We can show you how its best accomplished when you come in, and we sell the recommended brushes. We also have a free online tool for logging your brushouts at home, and we offer regular brushouts here if you want us to help. If your dog gets wet, dry and brush it immediately. This is especially true in the winter months. If your dog becomes wet when it is already matted, the mats can become worse and worse over time. Going really short would be the only true remedy at this point. If your dog wears a harness, sweater, or jacket, you should remove these items once your dog is inside, and brush its hair thoroughly and properly after removing them. Ask our groomers for advice. They have seen it all, and they are experts. They can give you great tips for keeping your dog looking and feeling its best going forward. Looking for detailed grooming information, such as prices, our groomers, hours, and much more? Ready to be the talk of the town?